The Kamkap is one of those machines you wish came in an adult package. Sleek and elegant, it’s a beauty to behold, but only pint-sized — my adult fingers struggled to find the keys. 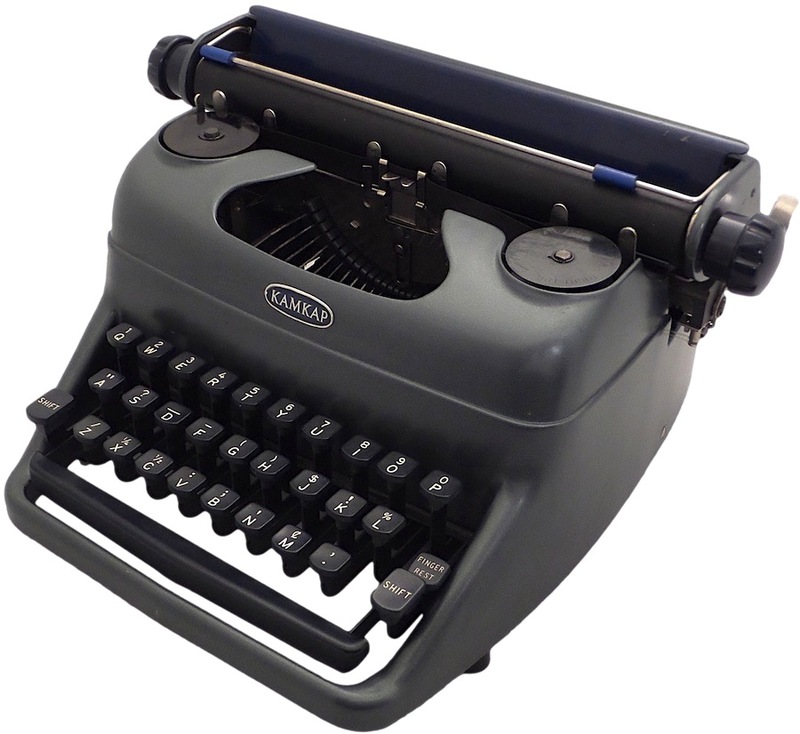 Yet the Kamkap stands out in that it so closely resembles an adult typewriter. A child must have felt very “grown up” receiving one of these — “This ain’t no toy!” reads one advertisement. 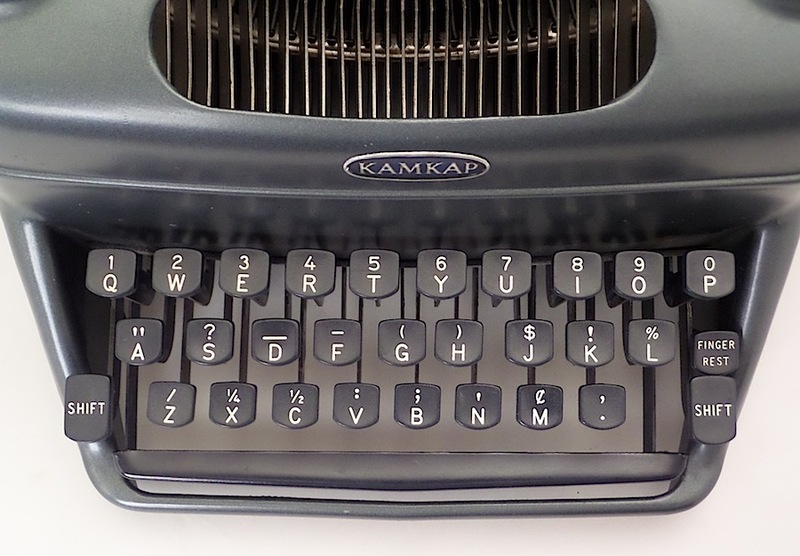 Manufactured in England, the Kamkap was introduced in 1956 and sold through 1958, at a variety of retailers, including Sears. Initially, it was priced at around $30. 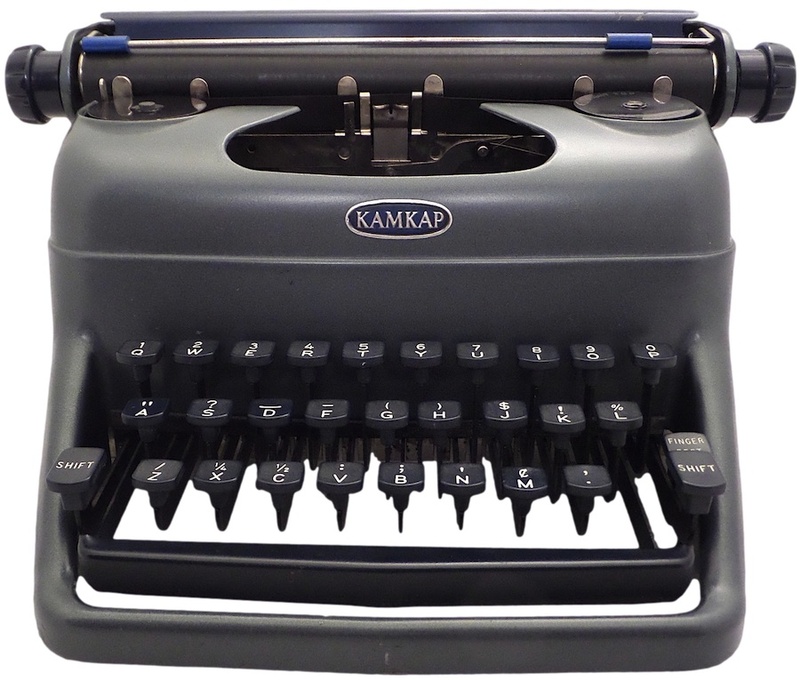 Despite being a reasonable facsimile of an adult typewriter, the Kamkap is nonetheless a toy. 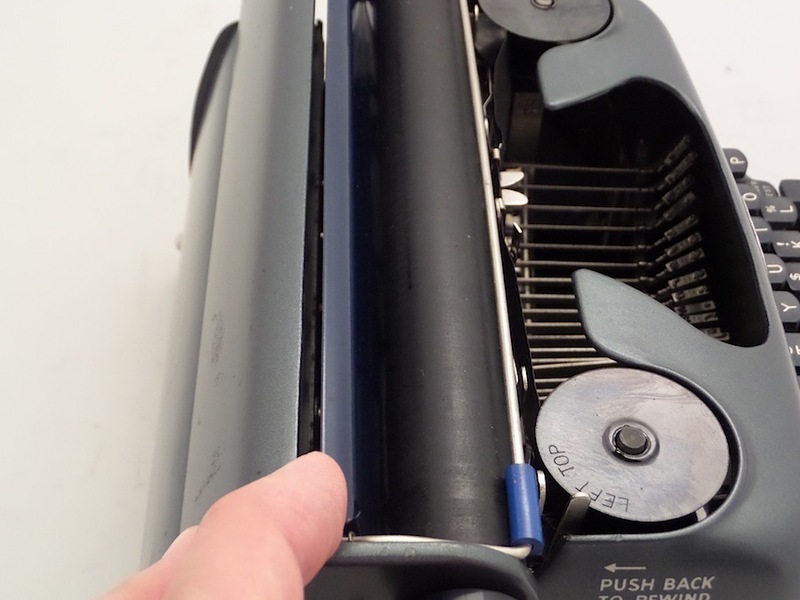 The typing action and alignment are not solid, being what one would expect from a toy. 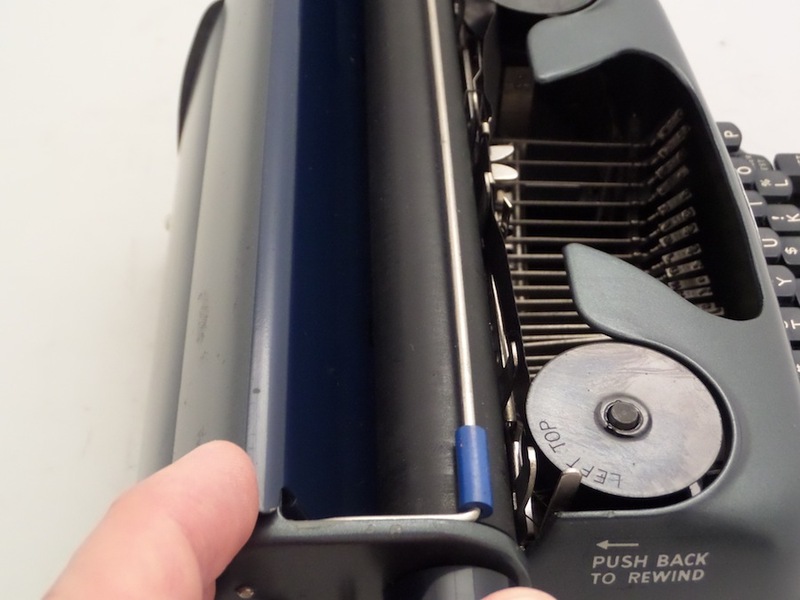 That said, it is a serviceable machine. It offers shifting for figures and symbols, and the italicized, sans serif font is pleasing to the eye. A child could type a report on it. 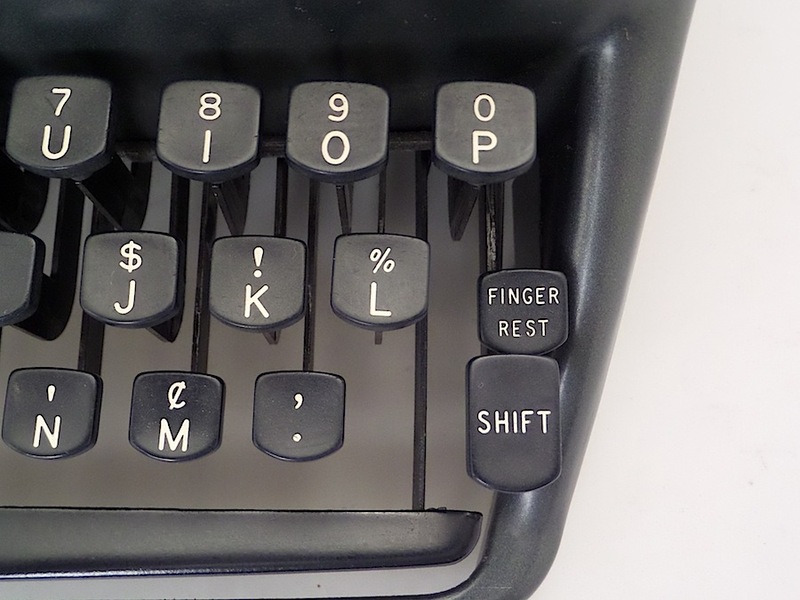 One interesting feature is the finger rest key above the right shift key (see photos below). 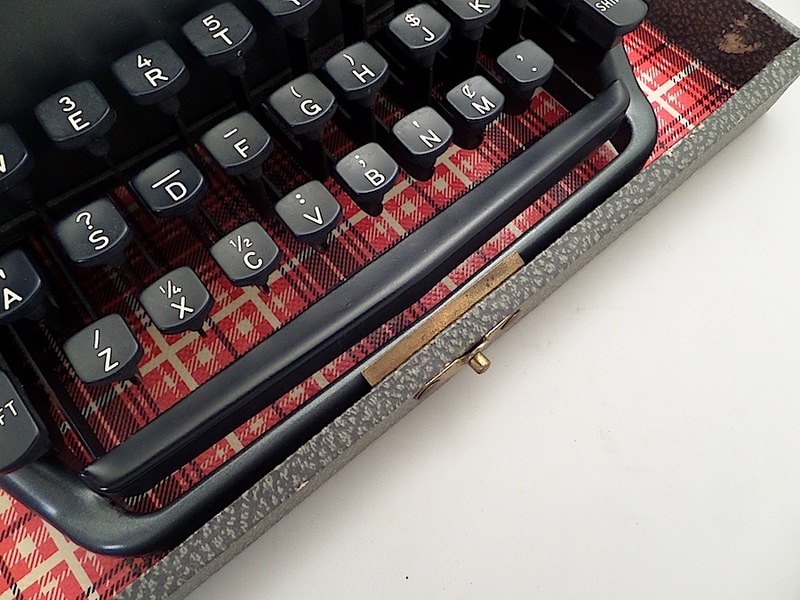 This non-operational key seems to function as a “place-holder” for touch typing. 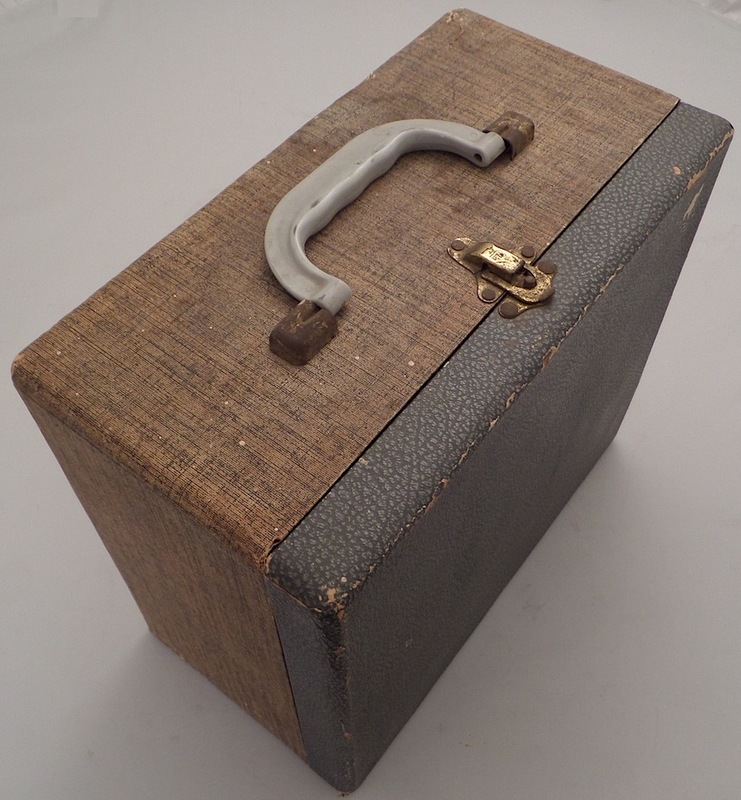 Kamkap offered optional carrying cases: a leather satchel or a hard case. Mine came with the hard case. Click to enlarge. Image from the Sept. 2005 edition of ETConline. 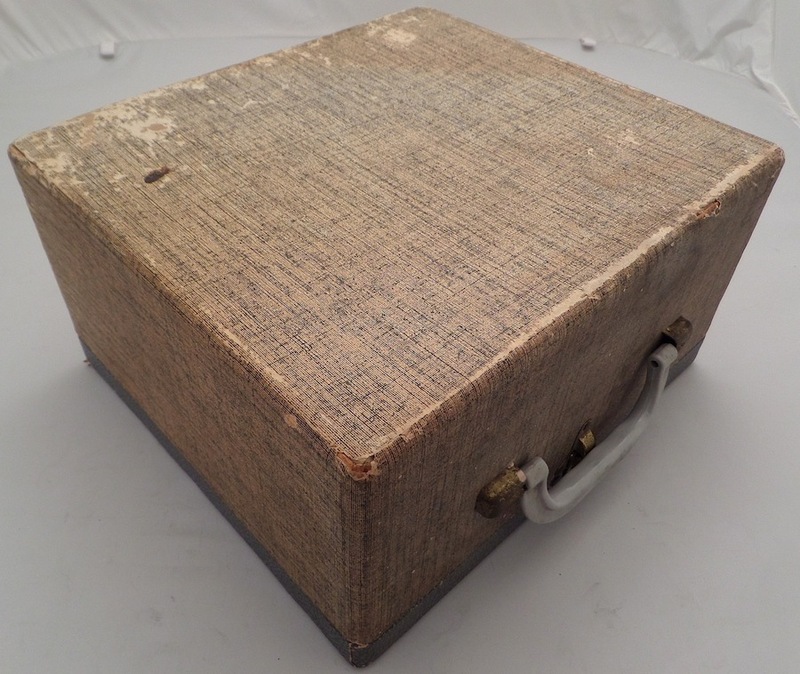 Sometimes called the “Super DeLuxe Model” or the “Revere,”1 the Kamkap was manufactured by Petite in Nottingham, England. 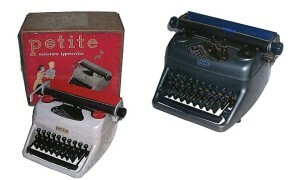 A very similar looking machine, called the Petite, was also offered in 1956. That machine has fewer features and is more brightly colored. On that note, it is interesting to observe that subsequent machines from Petite were more child-friendly, looking more and more like toys than real typewriters. Click on images to enlarge. You can also download a PDF of the manual here. 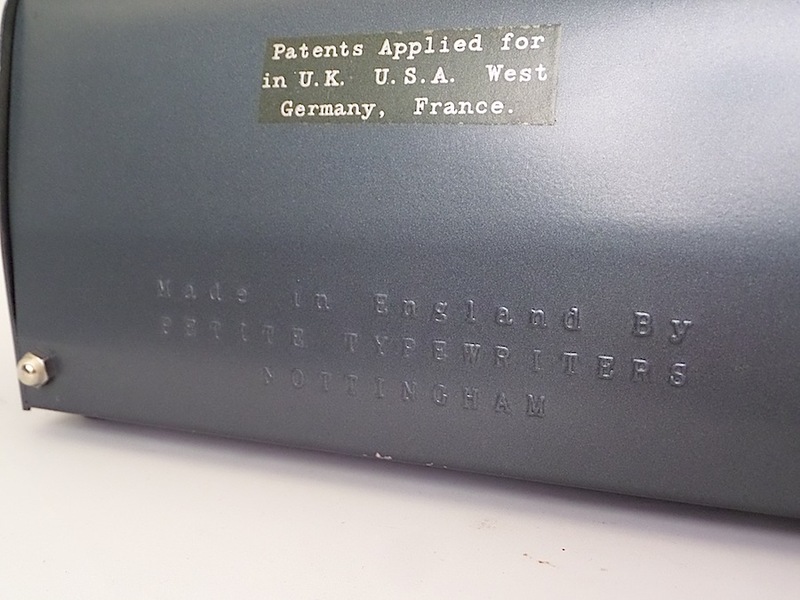 The rubber on the platen is hard, so typing out this sample was a bit of a challenge. 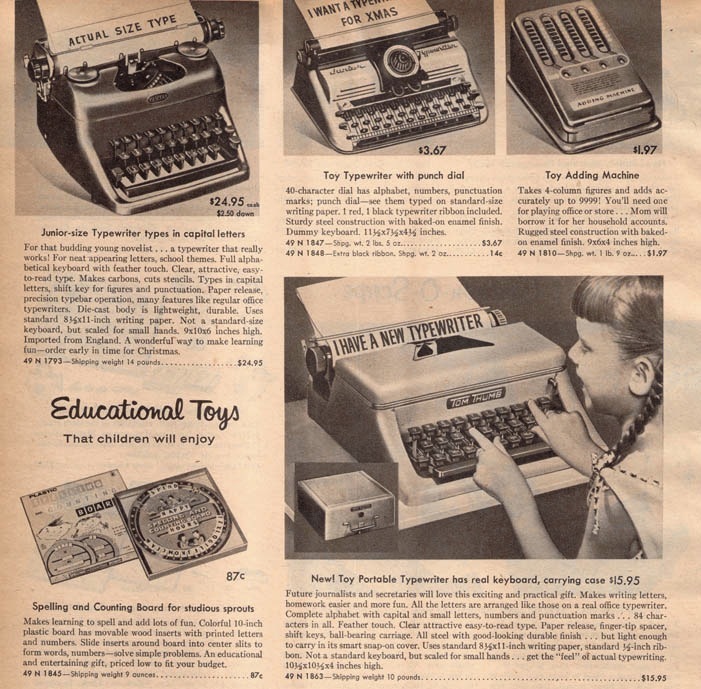 What I can say is that the all-caps font is very appropriate for a child’s typewriter: playful, yet acceptable for academic work. The sans serif font is italicized, but quite readable. The keyboard is certainly designed for a child’s fingers (small and compact). 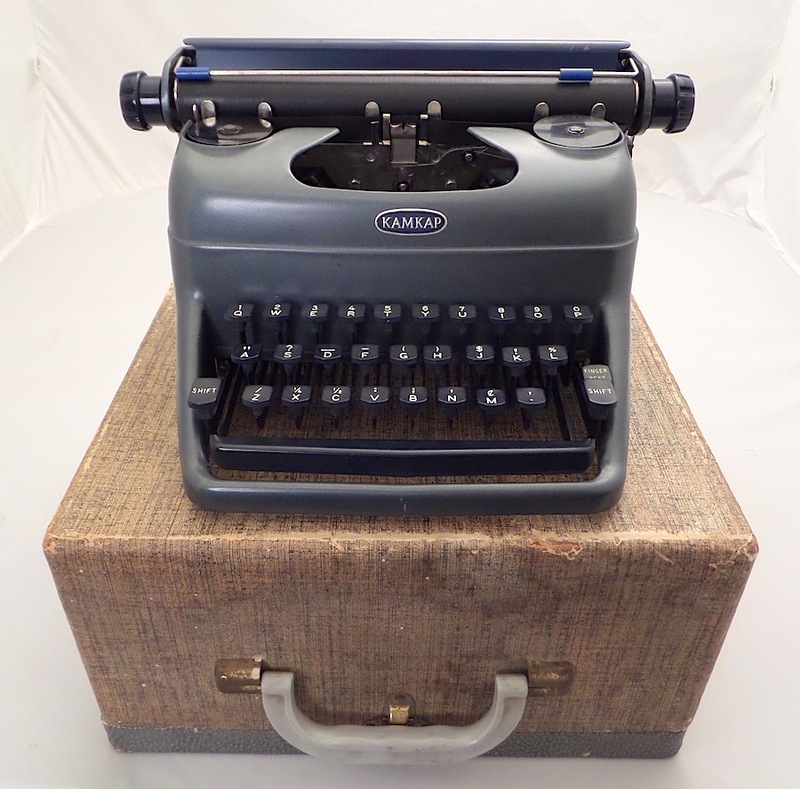 9″ carriage accommodates a full sheet of paper. “Finger Rest” is a non-operational key. 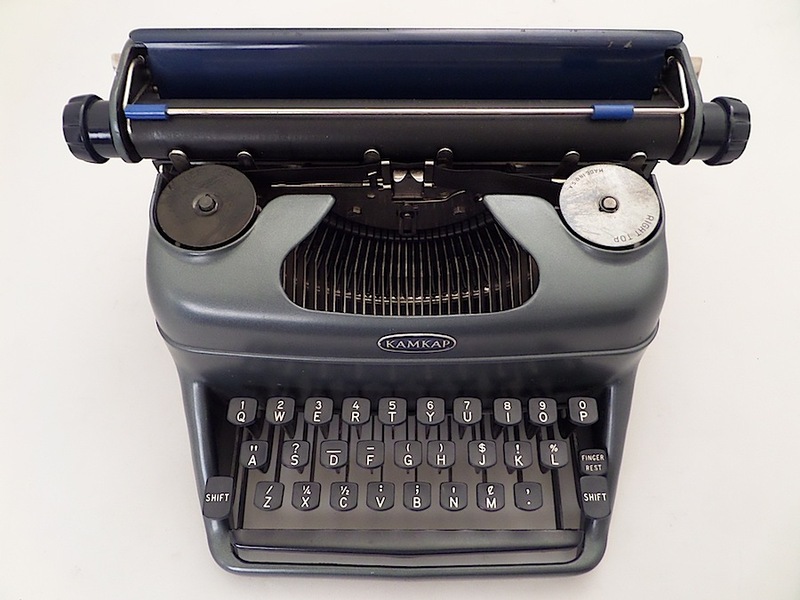 A placeholder for touch typing? 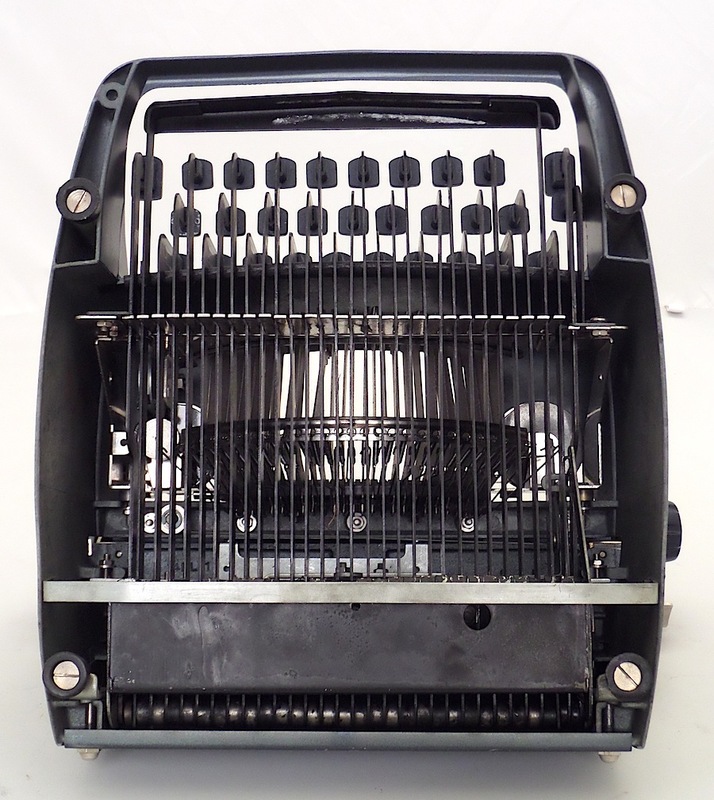 An all-caps machine. Shift is for figures and symbols. 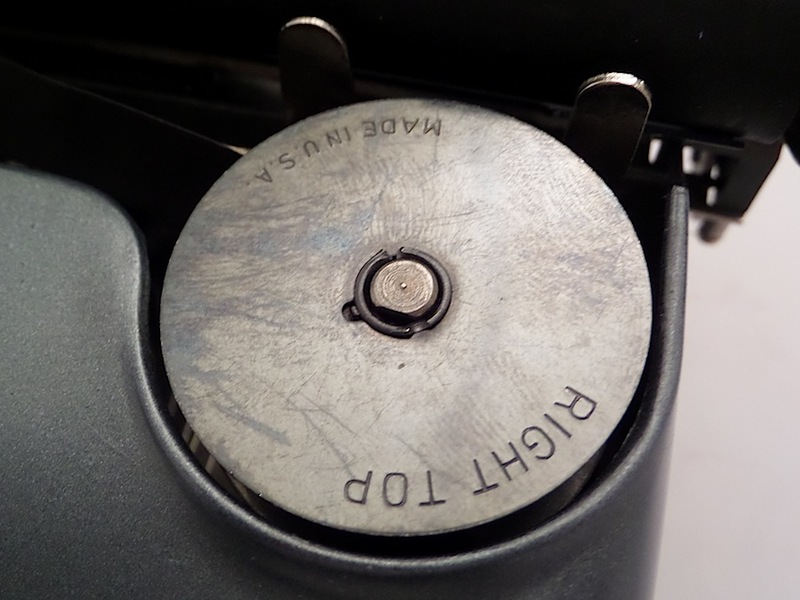 Typewriter made in England; spools made in America. 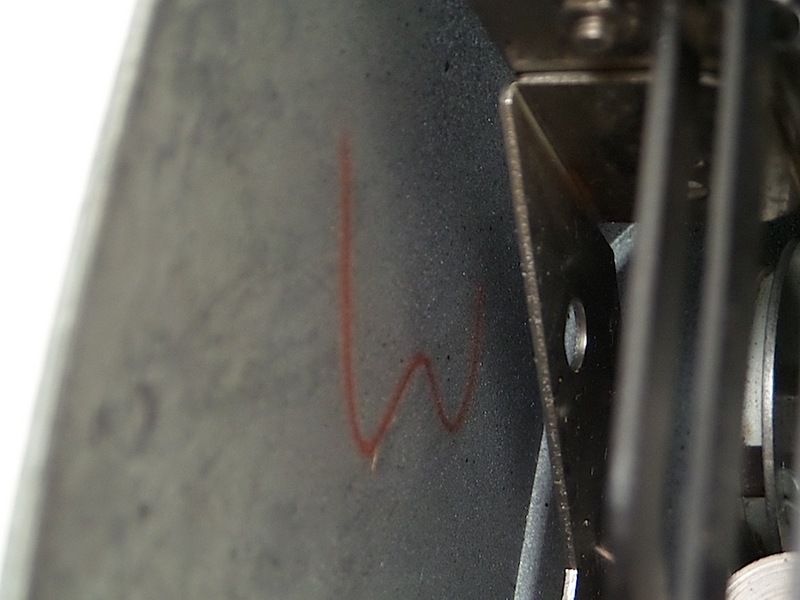 Stamped metal, corners bent inward. 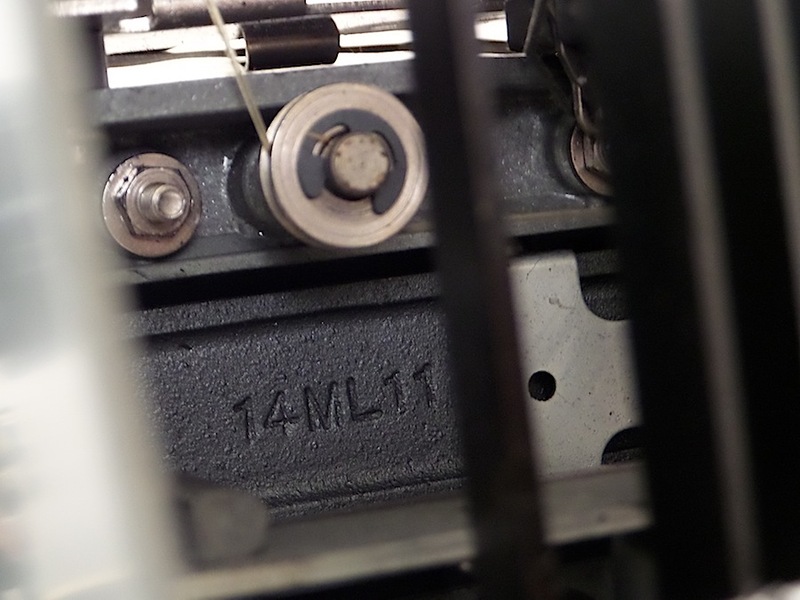 Serial number or casting stamp? 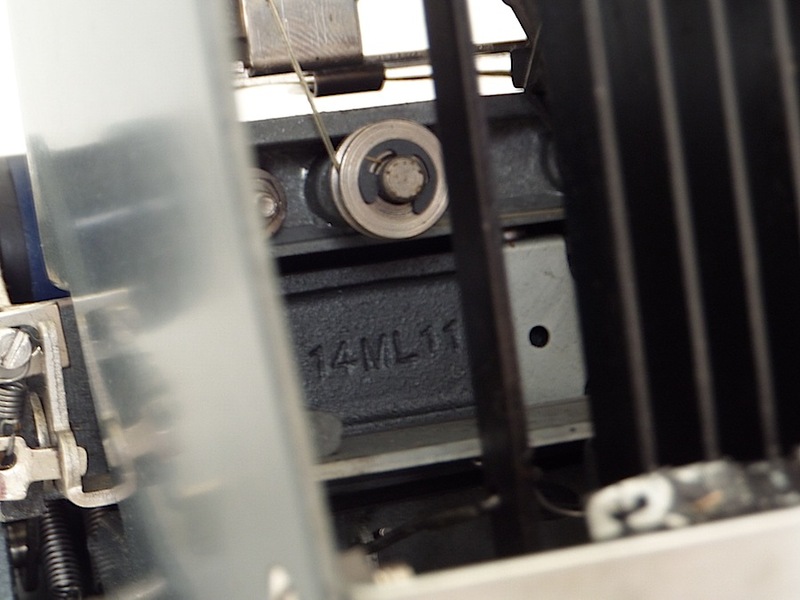 Located on the underside, near the side of the machine. A handwritten “3” on the inside. 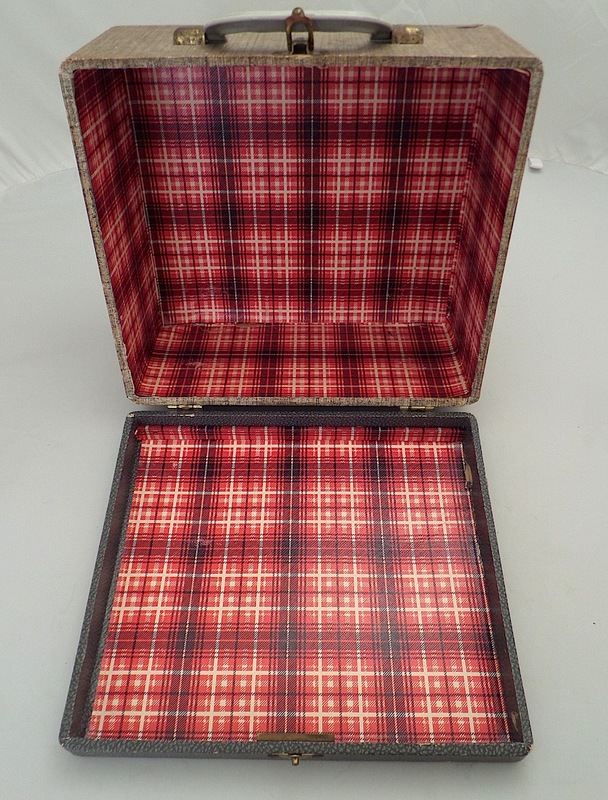 The case was optional, either a hard case (pictured) or a satchel. Just like mom or dad’s! 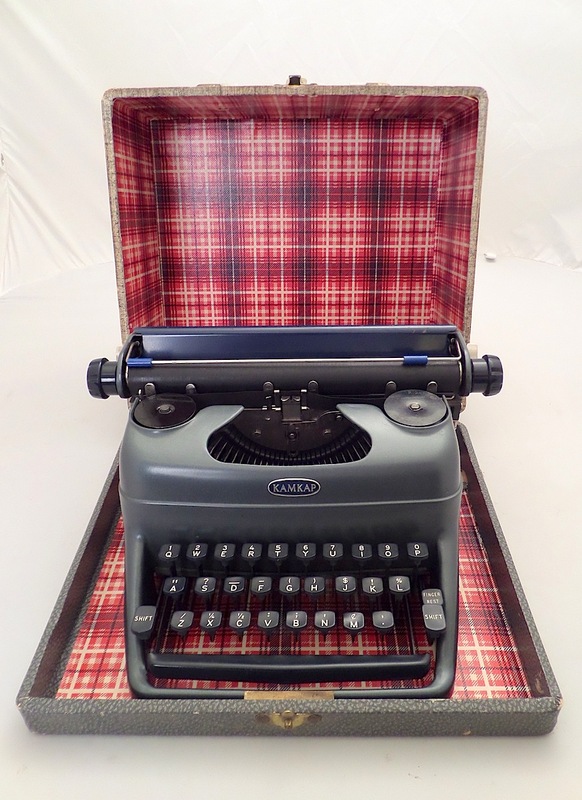 Like the typewriter, case looks like an adult product. Looks solid, but made of insubstantial materials. This one is nicely preserved. 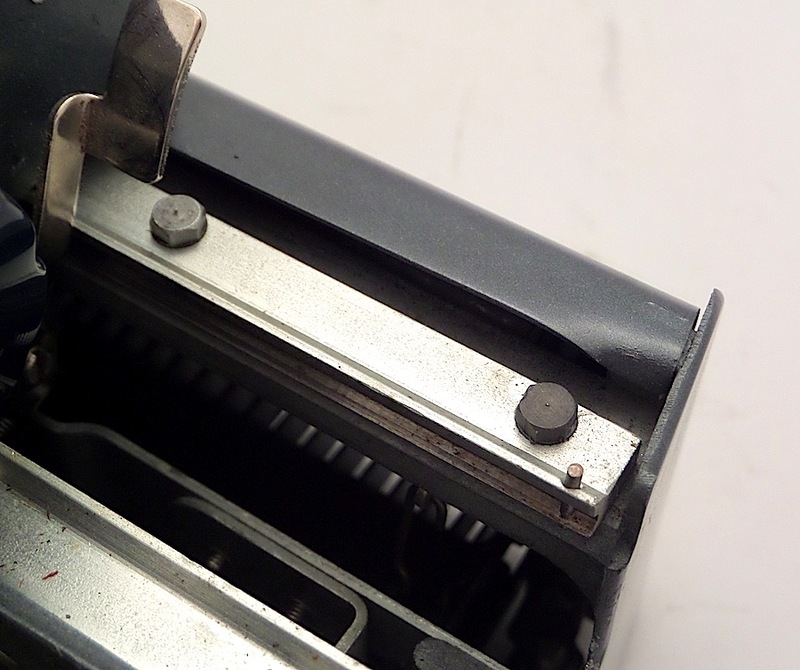 Typewriter is not entirely secure in case, but this metal piece anchors it somewhat. The cuter Petite and the Kamkap “Super-Deuxe Model.” From The Morning Herald, (Uniontown, Pennsylvania), Nov, 16, 1956. From the 1956 Sears Christmas Wishbook, curtesy Wishbook.com. 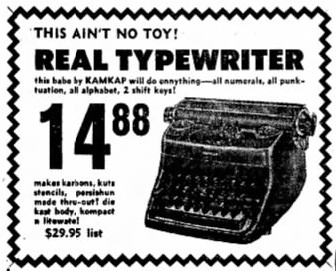 Hand-drawn typewriter scarcely resembles the “Kam-Kap.” From The Bridgeport Post (Bridgeport, Connecticut), Oct 23, 1957. 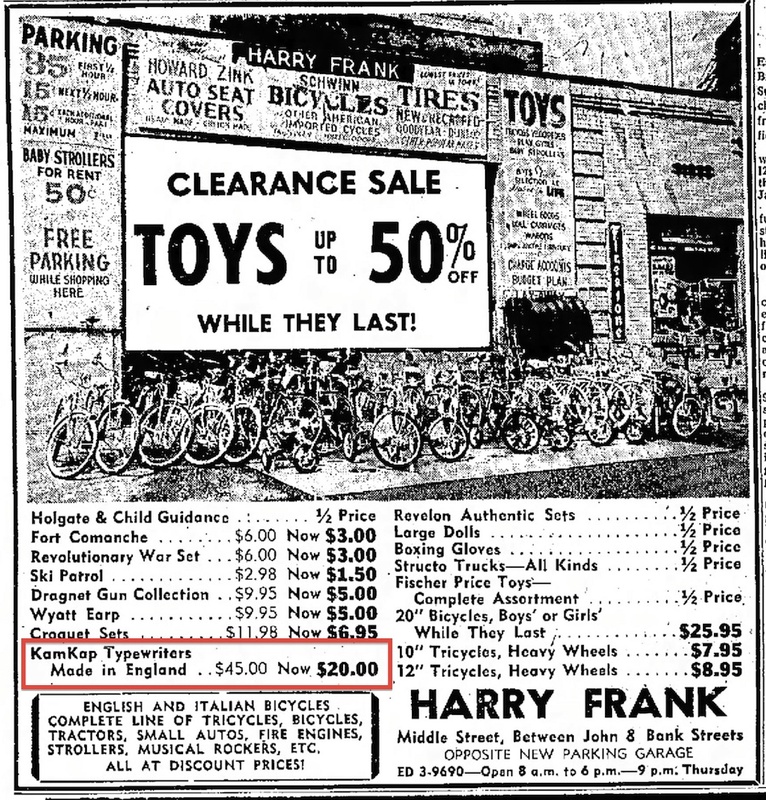 “This ain’t no toy!” From The Sandusky Register (Sandusky, Ohio), Nov 8, 1957. 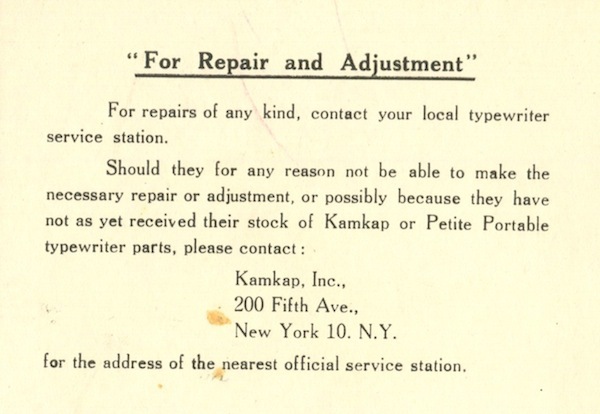 The Kamkap, called the “Revere” in this advertisement. Not sure why. 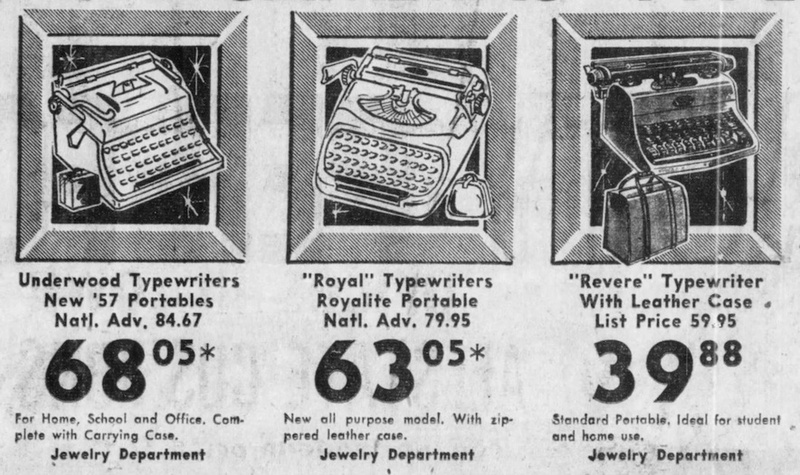 From The Kansas City Star, Kansas City, Missouri, Dec 10, 1957, placed by Gorman’s. 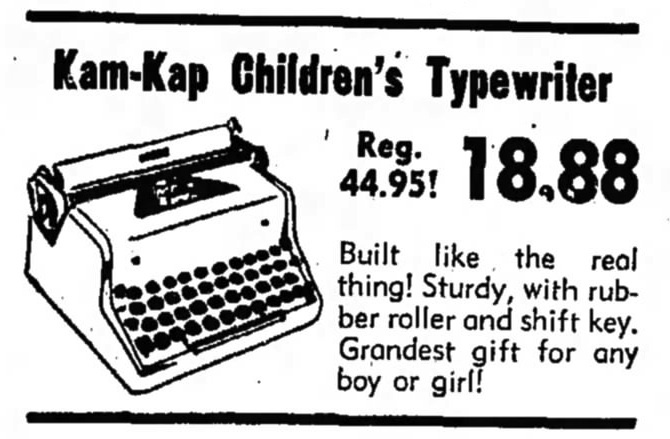 The last ad I could find for the “KamKap.” From The Bridgeport Post (Bridgeport, Connecticut), Dec. 10, 1958. My Revere is identical to the Kamkap, and has the same cast number. 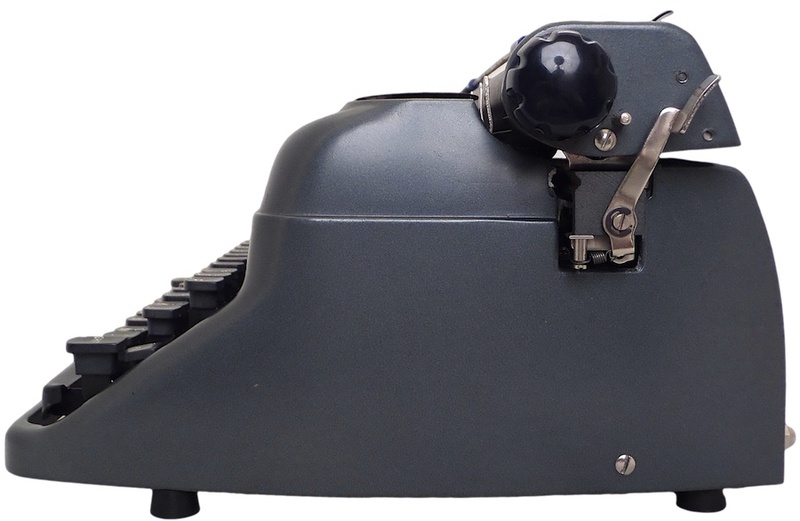 The Byron Mark I is a much larger, very grown-up typewriter, but the similarity in design and identical paint are notable. The two were definitely made by the same company. 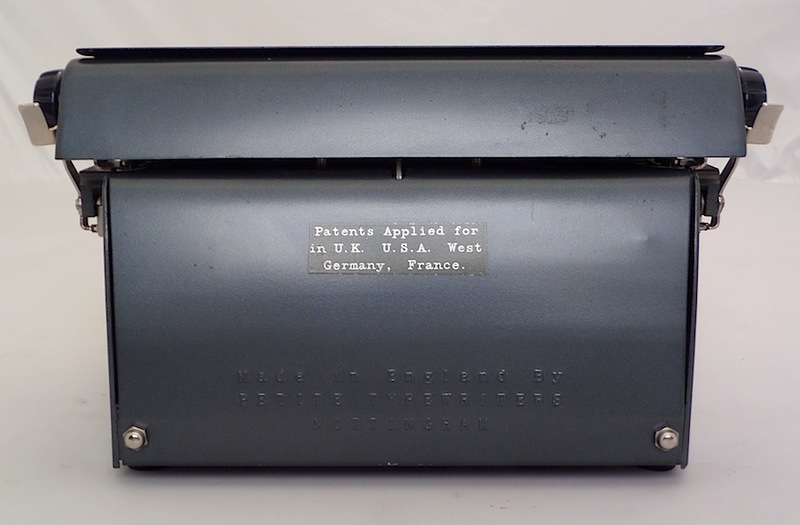 Yes, as I have pointed out in posts on my Kamkap and other Petite typewriters, Petite was a brandname of Byron Jardine, which was taken over by Dobson Park industries. The Jardines took over the Bar-Lock factory (built 1919) from the Richardsons in 1925. I just found a Petite in my attic. We bought this home in 2010. Home was built in the 40’s, I believe. 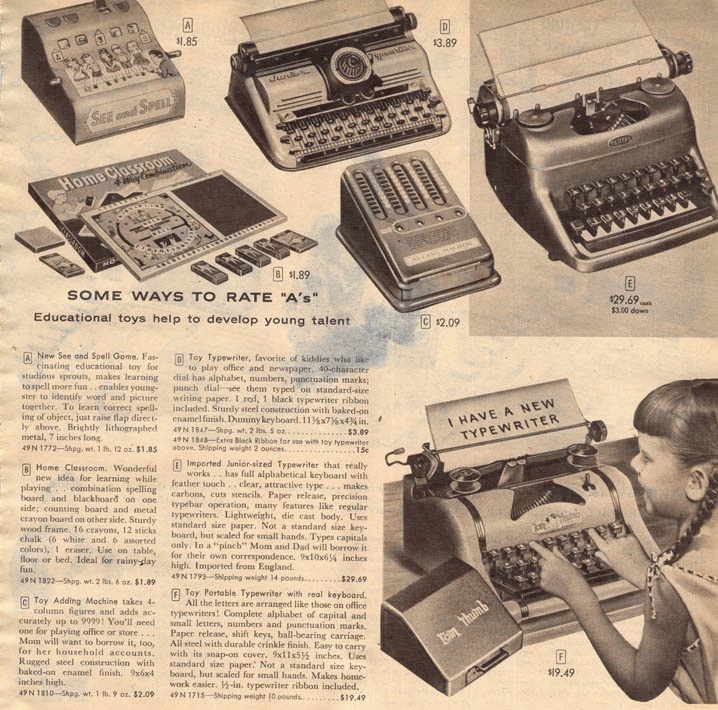 I know absolutely nothing about typewriters so thank you for the information! 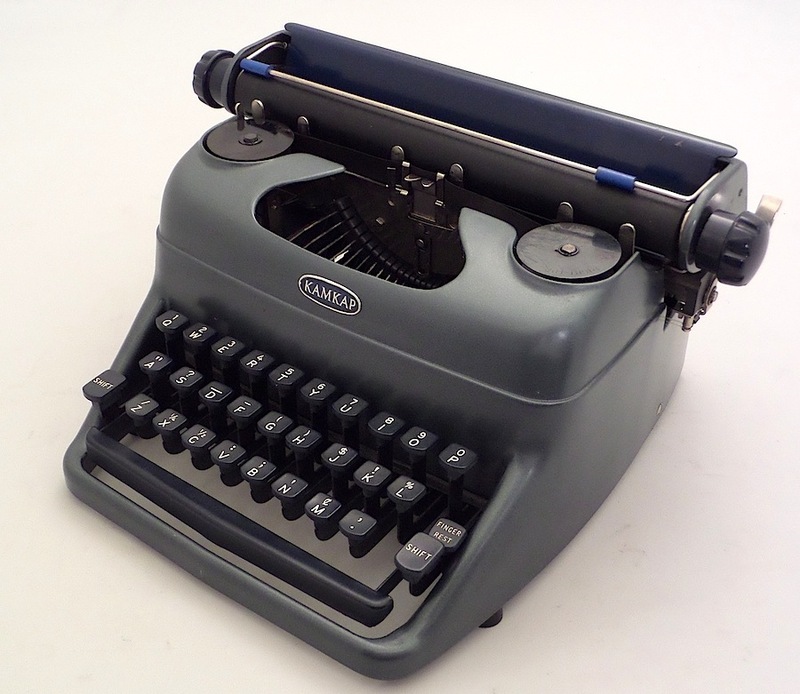 I love how it just has letter keys. I’m definitely holding on to this. I wish I had more pieces of simpler times. People tell me I have an old soul. I’m 35. 🙂 Have a good day! I have a kamkap mini give to us it has to be at least 50 years old. Is it worth anything?